I was recently wrangling with some nastiness involving several different tools, each of which was performing bytecode instrumentation. The problem was that one tool (Mockito, which I didn’t feel like digging into, and am using as a black-box) was modifying my transformed code, and it was very difficult to tell exactly what it was doing to my code. It is easy for me to dump out class files for the code that I generate, but seemingly hard to get Mockito to do. 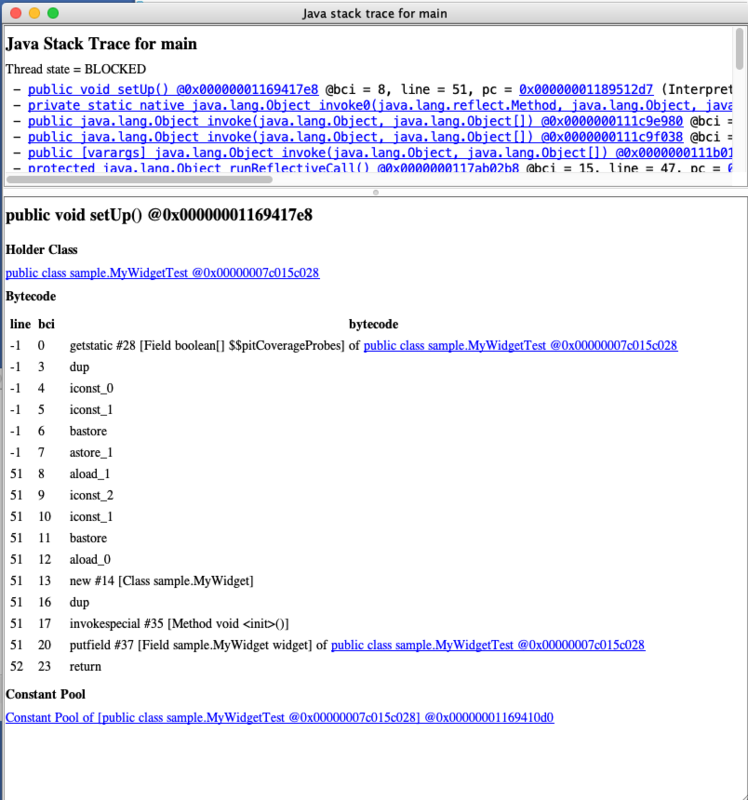 Shouldn’t there be some way to simply view/dump bytecode of classes from a running JVM? It’s all just sitting there in the heap, right? Make sure that JAVA_HOME is set to the same JVM that you want to attach to. 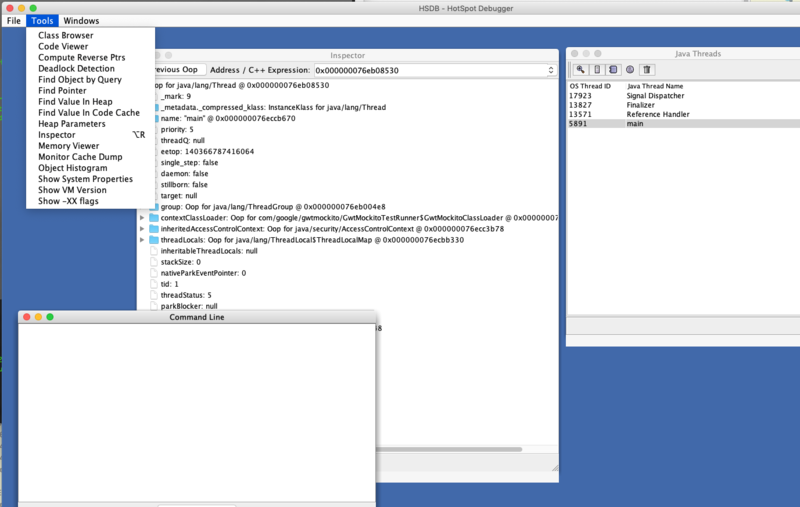 There may be a better way to control the execution with HSDB, but for simplicity I started my JVM (that I wanted to debug), used my regular debugger to pause execution where I wanted to inspect, then attached hsdb, then unpaused the debugger (so hsdb could communicate interactively with the JVM) and explored. If you do this, it is important to unpause the JVM from your (non hsdb) debugger after you attach hsdb. You can view the bytecode for any class loaded by selecting the option from the tools menu. If you want to go straight to bytecode for a method in the current stack trace, then taking the stack trace view will allow you to see the relevant code immediately (screenshot below). defineAnonymousClass is a super handy method of the notorious sun.misc.Unsafe “escape hatch” in the JVM. defineAnonymousClass is used as a fast-path to define specialized anonymous classes which are not rigorously verified, are not loaded into a class loader (e.g. they exist only so long as you hold a reference to one, perhaps through an instance of an object of that type), and can have their constant pools lazily patched at load-time. For classes that do not need to be accessible from anywhere other than the class that defines them, defineAnonymousClass is a much faster way to load in a class. defineAnonymousClass is used under-the-hood to implement Lambdas, and we aggressively used it to implement CROCHET. Which can be enough to point you to the method that’s failing verification to help you figure out what the cause of the error is (in this case, it’s that my instrumentation is adding a reference to a class not loaded in a class loader that is within the scope of the anonymous class being defined). Note also that due to a bug in OpenJDK versions 7 and 8, it is not possible to retransform lambdas using a java agent (thanks for the pointer, Katie!). 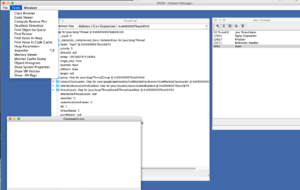 And, if you are debugging instrumentation in maven surefire/failsafe tests, you can set the flag -Dmaven.surefire.debug (or -Dmaven.failsafe.debug) when starting maven, and when tests start, it will first wait for the debugger to connect (on 5005). That's really really unhelpful, because it turns out that this method, handleReplicate, is huge, and all that it tells us is that somewhere in this method, there’s an incompatible argument to a function. Why wouldn’t it give us all of the helpful information in this error that it does above (with the exact location, and expected stack frame)? 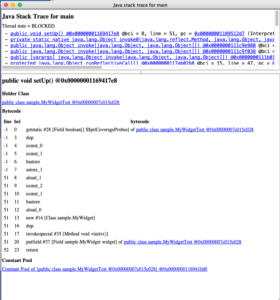 We might try to do javap and look at this method and try to figure out what’s going on, but, there might be dozens or hundreds of call sites in it, and carefully inspecting each to see where the invalid call is is annoying.